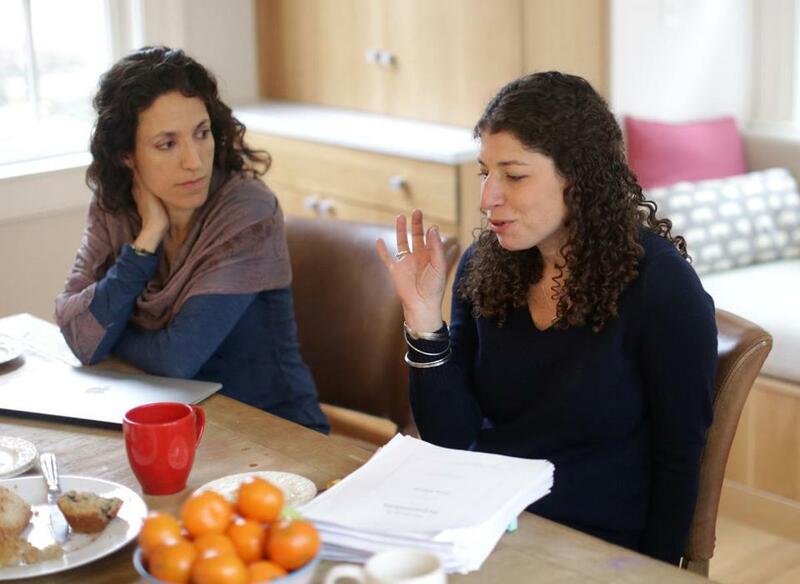 Rachel Kadish (left) and Tova Mirvis at a writers meeting at Jessica Shattuck’s home. Thankfully, no child threw up this particular morning. The six women authors, with at least two published novels and as many kids or more to match, amble into the sunny Brookline kitchen, ready to put daily parenting crises aside and dive into the nitty gritty of book publishing — agents, editors, submissions, and proposals. Despite the imagined glamour to the uninitiated, publishing can be a field rife with uncertainty and doubt, even for accomplished authors. The never being sure everything will work out, the molasses-slow submission process, harsh reviews, sparsely-attended book signings, and even readers who feel compelled to nitpick over typos. Each book presents a new chance to fail — or to just call it quits. They arrive at Shattuck’s home one recent morning, dressed in jeans, gulping down coffee and cake, and kicking off with an update of each woman’s most recent triumphs and tribulations: Shattuck’s new novel, “The Women in the Castle,’’ slated for release next week, has been selected the indie booksellers’ April pick of the month; Mirvis’s tattered unbound manuscript, peppered with Post-It notes, has made it through editing to page proofs; Pitlor’s satirical novel, first submitted to editors in June, has scored a publishing home. Talk turns to the delicate art of self-promotion in the days of social media (“I got a nice e-mail back from my gynecologist . . . I don’t know why we’re Facebook friends,” confesses Shattuck) and guiding Kadish on where to pitch an essay pegged to the June launch of her book “The Weight of Ink,’’ a work of historical fiction set in 17th-century London and a 12-year labor of love. There are also the woes: the perpetual battle with art departments over layouts and cover design, the challenge of placing a poetry manuscript, and even grappling with more existential questions, such as the relevance of literature amid the current contentious political climate. “I’m not feeling like these matter — that we read short, quiet stories,” confesses Pitlor, who edits an annual short-story anthology and has been struggling with crafting this year’s forward. “Art matters,” says Franklin, quietly. “Say what’s true,” advises Kadish. The practicalities of parenting inevitably seep into the literary life. 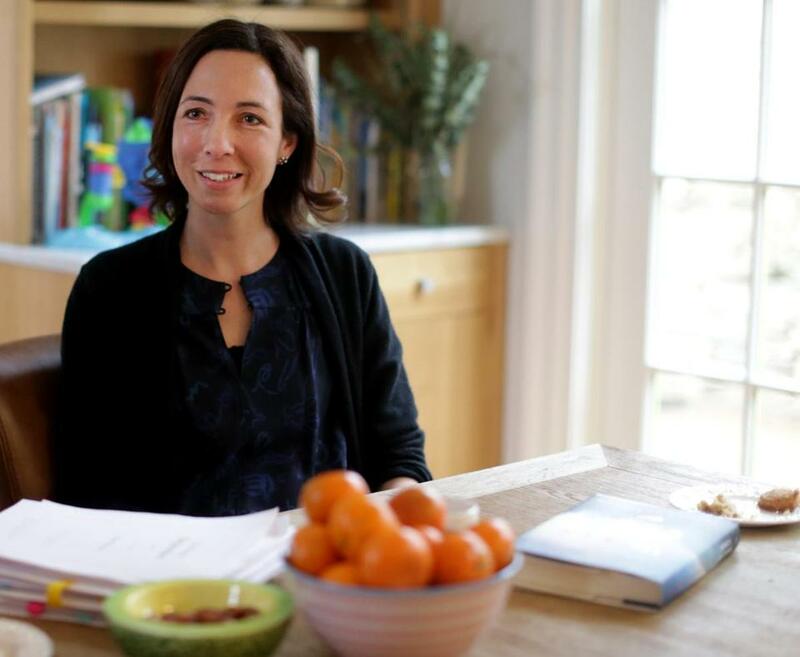 One author relates delivering a book talk with dried milk in her hair; another tells of the pressures of “writing on a meter” — paying $75 for child care in order to write three lines. Mirvis recalls a New York photoshoot for her book jacket being interrupted by a call from the school nurse that her child was vomiting. “You can see [the worry] on my face [in the photo],” she jokes. Yet for all the challenges, the women say, parenting has added “depth” to their work. The ability to truly know worry and fear on a gut level. Balancing complexes, grimly notes Rakoff, who is currently back in the trenches, juggling a toddler and two elementary-age kids. A prior version of this story incorrectly stated the number of children Rachel Kadish has. Melissa Schorr is a contributing editor at the Boston Globe Sunday Magazine and author of the young adult novels “Goy Crazy” and “Identity Crisis.” Her upcoming nonfiction book, “Shame Nation,” will be published in October.